I love doing art workshops for kids. They’re a great way of “keeping it real” as an artist and giving back. As well as gaining an insight into the country’s education system (so that’s where our taxes are going!). Facilitating art workshops help your budgeting skills too. You’ll be allocated a certain (often minimal) amount to cover the cost of things you actually need. As opposed to more tubes of paint and fancy sketchbooks you just want. Additionally, too much time in your studio can be isolating if you’re not sharing it with other artists. It’s fun to go out into the world with your talents. Right now I’ve got my thinking cap on as I may be doing more in the near future. 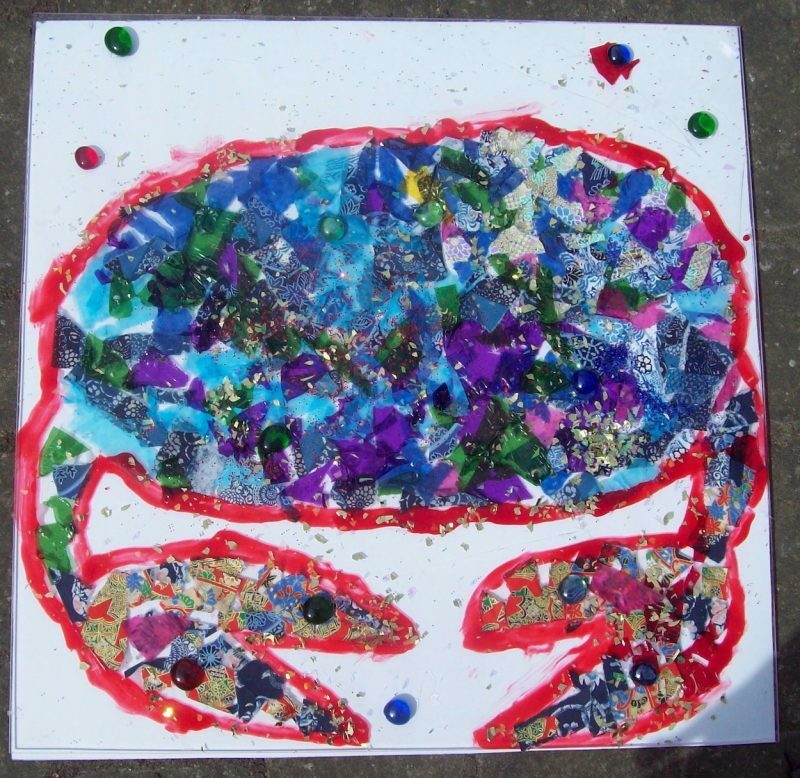 And I’ll be looking back to a successful one that I did with a London primary school using Perspex, glass paint and glass pebbles. In the past there seemed to be a lot more call for artists to work in UK schools. But more recently government cuts have seen many such projects off. After all, who needs art in schools? It helps kids develop their creativity, giving them some much-needed time away from tests. They learn to work together and take turns. They improve on expressing opinions and giving mini appraisals (of each others’ work). It can work in tandem with other lessons, leading to cross-pollination. For example, they can practise French vocabulary. Or describe the artwork they’re doing with those English adjectives they’ve been learning. Art workshops means a new person comes to school for the day, which is exciting for the kids. And of course, it can set them on the road to becoming doers or appreciators of art. I was contacted by a primary school in north London and asked to run some children’s art workshops over two days for Key Stage 1 classes. In England and Wales that means up to aged seven. They threw the Reception class in too (aged four). Good job I didn’t have to teach them all at once! The project was part of what was then called Big Arts Week where artists volunteer their time and simply charge for materials. However, many artist facilitator jobs are paid by the schools. Before the sessions I headed up to the school to meet the class teacher. She explained that they wanted to do a project based on nature. And asked me what I could do that was glass but not glass (cue scary images of small people running riot with glass cutters!). I had just the idea how to adapt it to be child-friendly. As you’ll see from these photos, the children created some impressive and vibrant work using lots of contrasting materials. I photographed the panels against white backgrounds to show the work more clearly. I particularly liked the ladybird with two extra legs and the flowers. Firstly, to work in a school in the UK you need an up-to-date DRB Check, a detailed certificate listing your criminal convictions (or hopefully your lack of them!). In Scotland it’s a similar document known as Disclosure Scotland. And it’s the Enhanced forms of both the DRB and the Scottish version you need since you’ll be working with minors. When you apply you supply current and past addresses plus plenty of ID. You can’t apply as a unique person. It needs to be via a school or community centre, unless it’s the basic certificate. Once you’ve got one though, it will last three years and should be able to use it in other places. So onto the practical side of H&S. Obviously real glass is out for children, although round-edged pebbles are fine. For the glass-but-not-glass project I decided on Perspex, ordering ten pieces measuring 50 x 50 x 0.4cm. The plan was to display them around the school afterwards. Therefore I asked the glazier to drill small holes in the top corners so I could thread them and hang at windows. 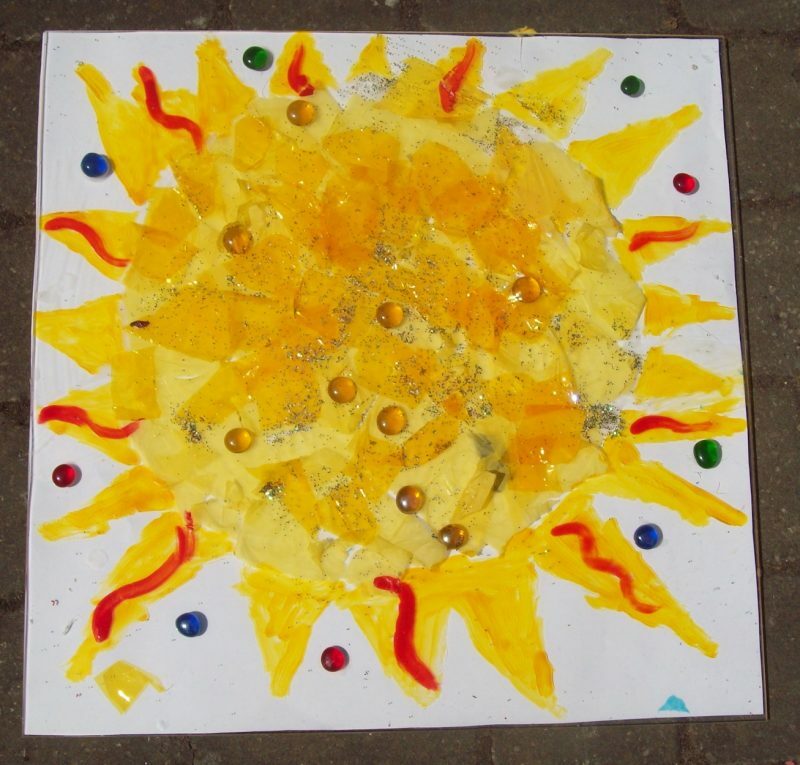 The children got to do something arty that they (probably) hadn’t done before, creating “pretend stained glass” panels. Hopefully they began to look at the real thing with interested eyes. 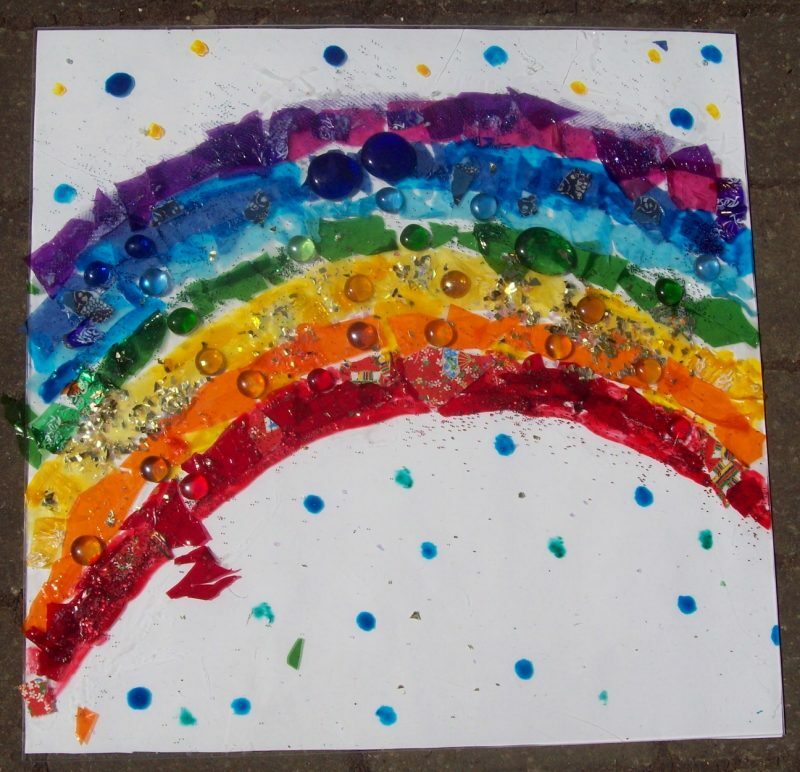 I also brought in Pebeo glass paints (water-based), coloured gels, glitter* and glass pebbles. I threw in a bit of origami paper and the odd pipe cleaner that I found lurking in my home studio. There’s no reason why you can’t do this on a smaller scale, in fact I’d recommend it with a more manageable class. I suggest using smaller squares (30 x 30cm should suffice) that they can then take home with them later. Otherwise described as crowd control. Luckily I learnt about this on my CELTA course (Certificate of English Language Teaching to Adults). But this is a whole new ballgame! So far none of my older students, not even the more fun-loving Spanish and Italians, have all grabbed pens at once. Or thrown tantrums because they’re put in a different group to their friends or bombed the classroom with glitter. At least it hasn’t happened yet. However, I often use the same techniques for this as I learnt with managing adults. I divide a class into smaller groups and once they’re sitting down I give a demonstration. I always invite one of the livelier kids out to “help” me – they’re easy enough to spot – so that the class can see what they’re supposed to do. After a perfect demo with a helper who gets it right first time, I ask the class to tell me what they have to do next so I know they’ve understood. Lastly I’ll monitor, popping round the groups to see who needs help and who’s racing ahead. That way I identify the strongest participant in each group, giving him/her the “job” of helping those who need a hand. It’s a great way of managing the more mischievous ones. Sometimes one or two of them will get a bit over-animated – they are kids, after all – which is a good time to get them to stop and focus. A quick break or a tree pose can help quieten down a rabble (worked well in Japan!). Get organised: Two or three weeks before the project, ask the school to contact parents to see if they have any odd scraps of fabric or unused tiles. This will keep the cost of the materials down, plus teaches kids about the importance of recycling. 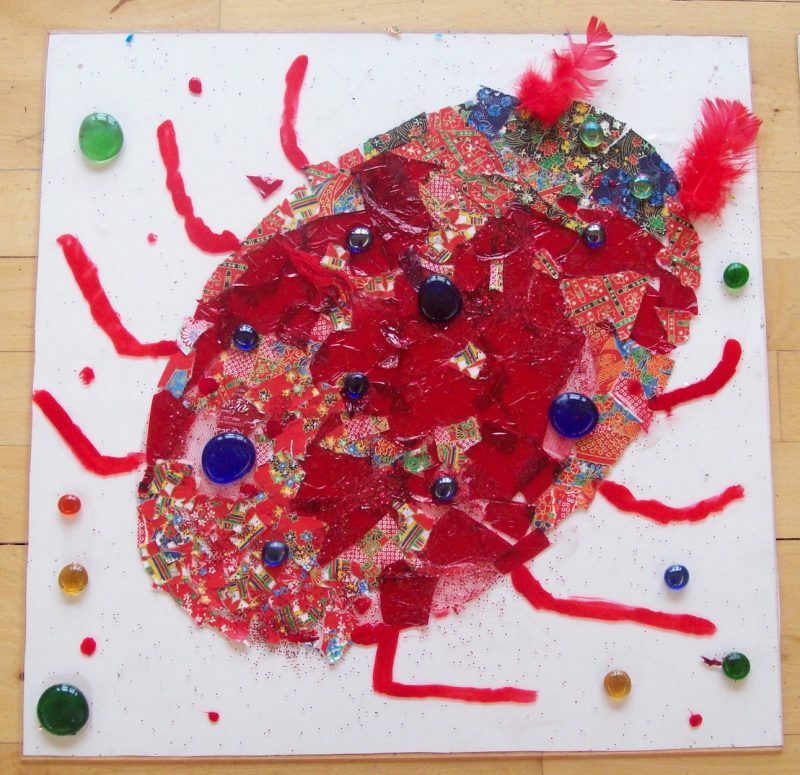 Ask local businesses to contribute materials: When I did a mosaic workshop in London, a local shop was delighted to donate lots of broken tiles and end-of-line products after hearing about my art workshops in a local primary school. I went in expecting two or three boxes of run-of-the-mill tiles in neutral shades. But I left with boxes of shiny orange, bright blue and circular ceramic ones! Give the business who contributed a thank you on your blog and/or social media channels, along with photos of the kids’ work. Or ask the school to mention it on theirs. Ask the teacher to get them to make name badges: Crowd-control is easier when you can name faces. Keep a supply of bits and bobs you can bring to workshops: Plastic spatulas, kids’ paintbrushes, shiny things and a big squeezy bottle of PVA glue are useful, even if schools have their own to offer. Arrive early and set out tools and materials on the tables: That was they don’t all charge around the classroom at once. Don’t give kids too much choice: You’ll be there all day! When I did the Perspex project I had nine sessions to run. Instead of starting each class and asking the children what random animal/scene/object from nature they wanted to work on, I held up two outlines I’d prepared the day before. “Okay, hands up who wants to do a crab. Hands up who wants to do a butterfly.” The majority wins and the kids have made a choice (or think they have). Make sure there’s a teaching assistant at hand: Check with the school first. You’ll need the extra pair of hands and you’re not the teacher! Leave time for clearing up: If small people can create mess they can clear it up too. End your session with feedback: Get kids to set their work out at the front of the room and pick their favourite (not their own!). Ask two or three at random to say why they chose them. It’s a lot of preparation with a rewarding outcome. Next one will be easier and you’ll find out what works and what you need to work on. And you can be sure kids will let you know! Enjoy your workshop – and learn. 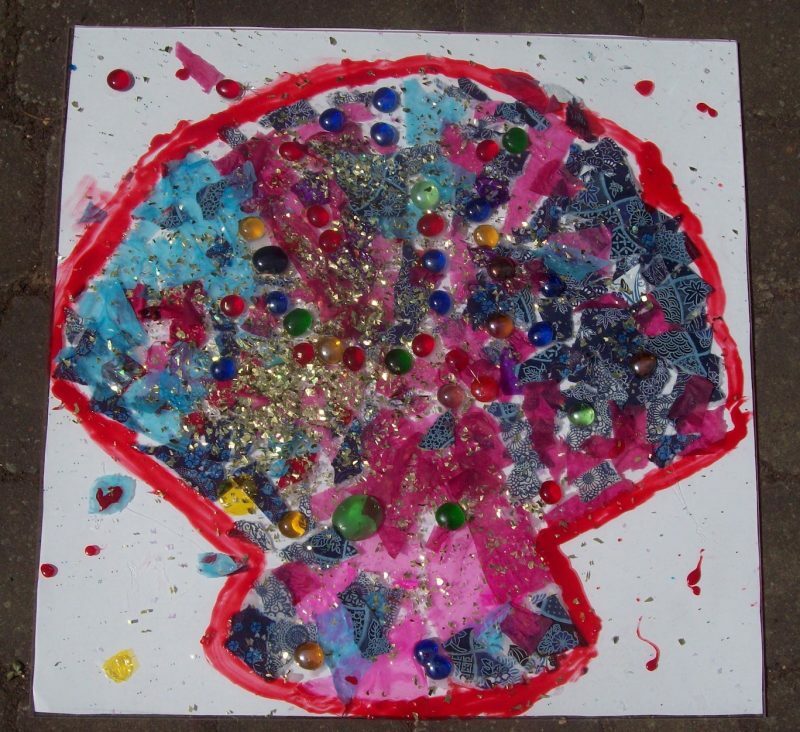 Do you have any experience of running kids’ art workshops or art parties? Leave me a comment below. THIS IS AN UPDATED POST FROM JANUARY 2017. * Glitter kills! Check out Catherine’s post on Not Dressed as Lamb on why our common-or-garden glitter us such a threat to out or marine life. I’m a huge fan of adding sparkle to my artwork, but frim now in I’m buying the biodegradable alternative from Wild Glitter. It’s pricier, yes. But if you teach your class to USE it SPARINGLY then that’s another invaluable lesson for them.